Die Mercurii, ult' Martii, 1641, post meridiem. 1a vice lecta, AN Act for the farther Relief of his Ma- est Billa, jesty's Army, and the Northern Parts of the Kingdom. 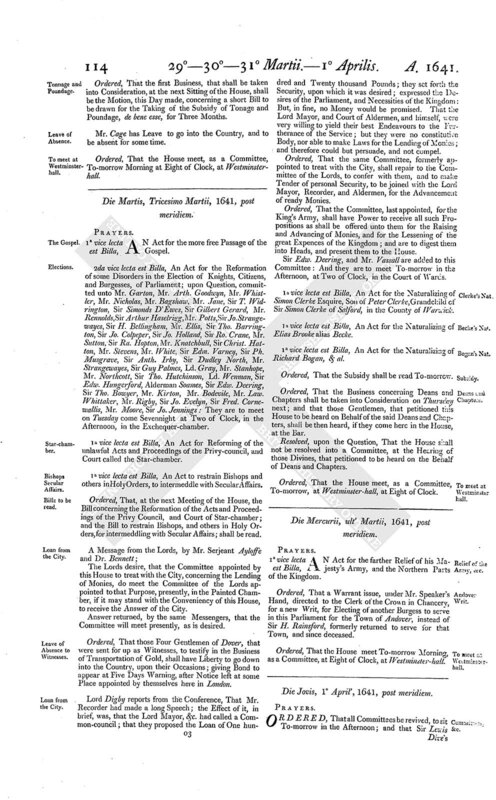 Ordered, That a Warrant issue, under Mr. Speaker's Hand, directed to the Clerk of the Crown in Chancery, for a new Writ, for Electing of another Burgess to serve in this Parliament for the Town of Andover, instead of Sir H. Rainsford, formerly returned to serve for that Town, and since deceased. Ordered, That the House meet To-morrow Morning, as a Committee, at Eight of Clock, at Westminster-hall.